The Galco Matrix® line is the next generation of thermoplastic holsters and accessories. It is water friendly, lightweight, comfortable to wear, easy on the budget, and almost maintenance free! 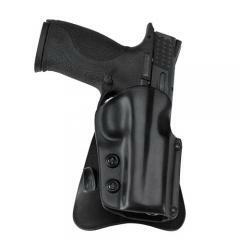 Among all the many choices for plastic holsters in the marketplace today, why does the Galco Matrix stand out? Most obviously, in appearance u unlike so many other harsh, mechanical-looking plastic holsters, the Galco Matrix resembles a hand-molded leather holster. Most importantly, in strength: Because it is injection molded, it is considerably more durable and free of the structural weaknesses associated with other manufacturing methods. Yes it will fit 92 with Rails.